The Tungsten PET/MR Syringe Shield 3cc is available in vast range. This range of syringe shield is widely used in the nuclear medical industry for the shielding purposes. This offered tungsten shield is manufactured by using high density tungsten alloy. 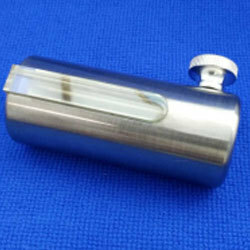 This Tungsten PET/MR Syringe Shield 3cc also has a well fabricated thumbscrew which helps to hold the syringe firmly in place. Barrel of the shield is constructed of .34" thick (9 mm) along with the tungsten which attenuates FDG F-18 by 88%. tungsten which attenuates FDG F-18 by 88%.